Prior to the early-1900s, most vessels were powered by sail; the absence of a fuel to move was a major factor in the flexibility of fleets. And, the carrying capacity of the sailing ship made it an indispensable element in its own logistic support. The gain in control of where you were going (without reliance/variation in the wind) was a significant improvement for the long haul. But, for a time, the inordinate amount of space that had to be allocated to carry coal seriously inhibited the usefulness of early warships. The replacement of sailing ships with steam led to a requirement for fuel to be widely available. Ultimately, this produced the need for numerous coaling stations – places where the ships replenished/refueled their supply of coal. Noting the need for a refueling site in the Pacific, Captain AT Mahan noted, “To any one viewing a map that shows the full extent of the Pacific Ocean, with its shores on either side, two circumstances will be strikingly and immediately apparent. He will see at a glance that the Sandwich Islands stand by themselves in a state of comparative isolation, amid a vast expanse of sea”. “From San Francisco to Honolulu, 2,100 miles easy steaming distance, is substantially the same as from Honolulu to the Gilbert, Marshall, Samoan, Society, and Marquesas groups (the nearest inhabited islands,) all under European control”. In May, 1899, a coaling station with a capacity of 1,000-tons was established and plans involved increasing that capacity 20-fold. Six months later the Naval Station, Honolulu, was established. Networks of coaling stations were established, effectively extending the range of warships; however, the era of the steam warship powered exclusively by coal was relatively brief-lasting from 1871 until 1914. The USS Texas, commissioned in 1914, was the last American battleship built with coal-fired boilers. It converted to burn fuel oil in 1925 – resulting in a dramatic improvement in efficiency. By 1916, the Navy had commissioned its first two capital ships with oil-fired boilers, the USS Nevada and the USS Oklahoma. Wartime needs called for more expansion to the Pearl Harbor base facilities. Construction began on a fourth large drydock at the location of the old Coaling Station; these went into service in 1944. 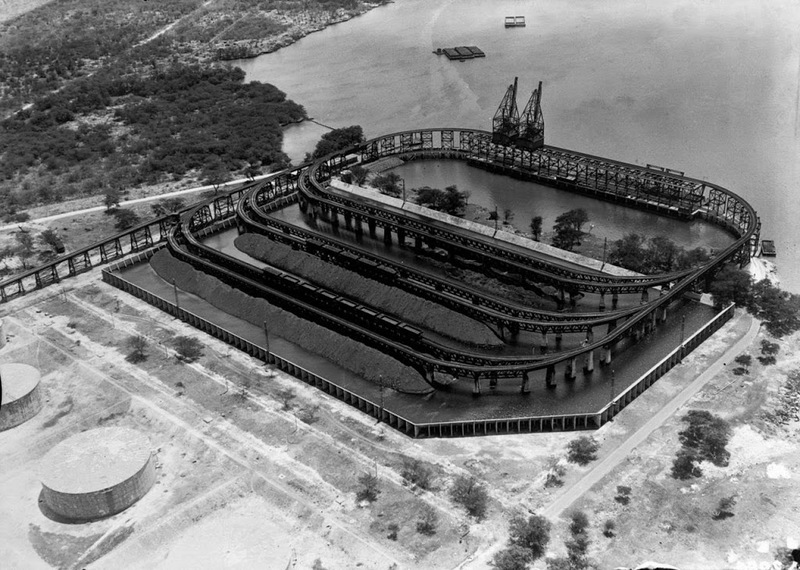 The image shows the Pearl Harbor coaling station in 1919. In addition, I have included more related images in a folder of like name in the Photos section on my Facebook and Google+ pages.